50% Bitcoin Welcome Bonus up to $500 from Bovada! New Customers can redeem Bovada promo code BVSBITCOIN50 for a 50% deposit bonus up to $500 when depositing with Bitcoin! Deposit with a credit or debit card and receive a 50% deposit bonus of up to $250 with only a 5x wagering requirement! BVSBITCOIN50 Sportsbook - Bitcoin Bonus 50% Bitcoin deposit bonus up to $500 with a 5x wagering requirement, new customers only. CLICK HERE Sportsbook - Standard Bonus 50% deposit bonus up to $250 with a 5x wagering requirement, new customers only. BVCBITCOIN150 Casino - Bitcoin Bonus 150% up to $1,500 with a 25x wagering requirement, redeemable three times. NEWWELCOME Casino - Standard Bonus 100% up to $1,000 with a 25x wagering requirement, redeemable three times. Bovada is a U.S.-facing online sportsbook that’s a top choice among NFL fans. It offers an attractive welcome bonus to all newcomers and rewards existing members with bonuses and cash back on losses. The minimum deposit at Bovada is $20 plus any fees associated with your chosen payment method. Bovada offers to match your first deposit by 50 percent up to $250. 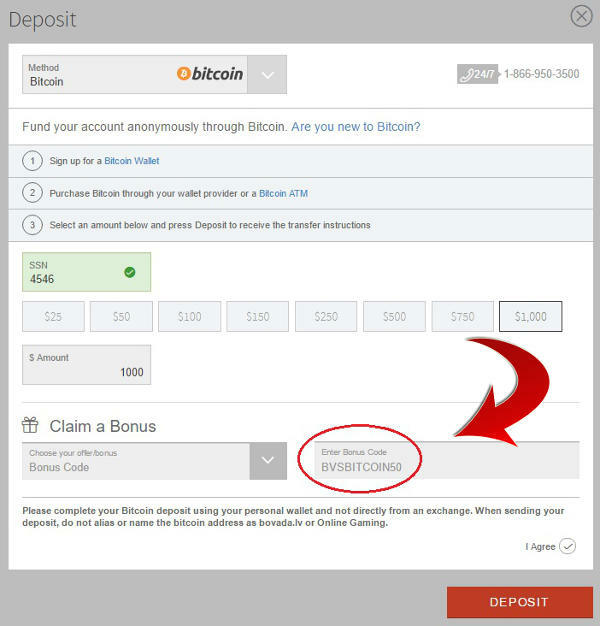 If you make the minimum $20 deposit, then you would receive a $10 bonus, and you would need to deposit $500 in order to claim the maximum bonus. No promo code is required. Instead, you just click through to claim the signup bonus, and the sportsbook will automatically apply the promotion for you. Note that the bonus money won’t be deposited into your bonus account until the actual deposit has cleared. Click here to join Bovada! You are free to use your deposit however you see fit. There are some limitations on the bonus. Live dealer games and the poker room are off-limits, but you can use your bonus money at the racebook and the casino in addition to the sportsbook. The sportsbook and racebook have a 5x rollover requirement on the initial deposit and the bonus before you can make a withdrawal. If you play through your deposit and bonus and zero out your account, then your obligation to Bovada is complete. If you deposit $50 and claim a $25 bonus, you would need to play through 5 x ($50 + $25) = $375. Note that the casino has a 30x requirement. If you spin a slot machine just one time, then the requirement on your entire bonus would increase, so you’d have to play through 30 x ($50 + $25) = $2,250. That is a massive difference! Therefore, if you join Bovada because you love betting the NFL first and foremost, it behooves you to avoid using any bonus money on casino games! There are other welcome bonuses offered by Bovada, including a casino bonus and a poker bonus, but those bonus monies cannot be used at the sportsbook. However, one additional bonus that NFL fans may want to take note of is the bitcoin offer. This requires using promo code BVSBITCOIN50 during your first deposit and making that deposit in a cryptocurrency. Bovada will match your deposit by 50 percent up to $500, and that makes it a more lucrative offer for those comfortable depositing with bitcoin. Navigate to the Bovada website using your web browser of choice. Click on the red JOIN button at the top of the page. Note that if you click a claim offer button or link and are not signed, it will have the same effect as clicking the JOIN button. Fill out the registration form with information that is accurate and verifiable. Click the submit button to open your account. 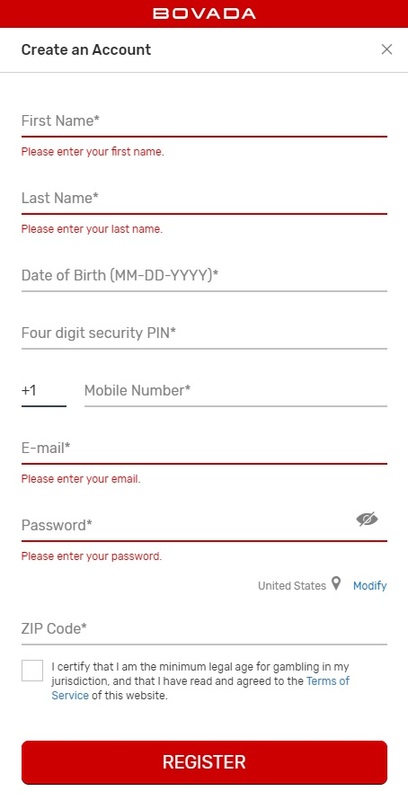 The first step of verification will be through email, but you’ll need to take a second step before making a withdrawal, and that includes emailing or mailing a scan of a government-issued photo ID and proof of address, such as a dated utility bill. Once you’ve validated your account and logged in to the website, click on your balance at the top of the page. Then, click the Deposit button. Select your deposit method from the drop-down list. Enter the deposit amount as well as any information relevant to that payment method, such as a credit card number. If you are claiming the regular signup bonus, then no coupon code is required. It’s automatic, and you’d actually have to opt out via the cashier if you didn’t want it. 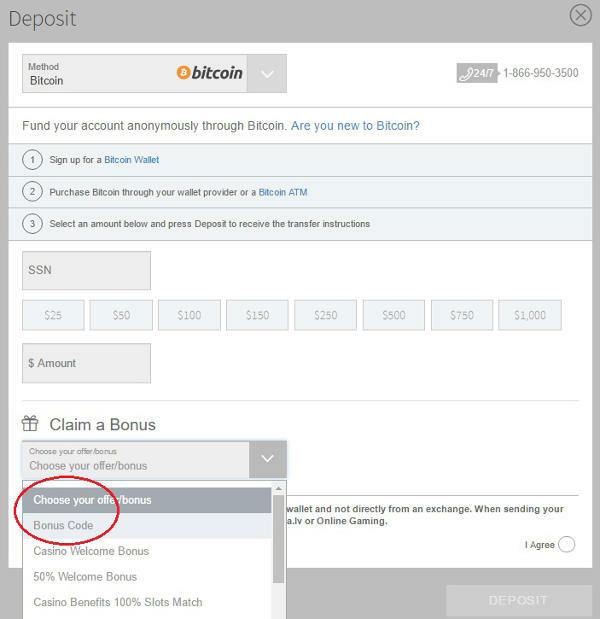 If you are claiming the bitcoin bonus, then you need to click on the Bonus Code option and enter promo code BVSBITCOIN50 in the provided box. Finally, click the Deposit button at the bottom of the page to finalize the transaction. Note that Bovada customer support is available 24/7. If you run into any issues while making your deposit, you can click the live help button at the bottom of the page for assistance. In addition to the welcome bonuses, new Bovada customers earn additional benefits and perks with the Bovada Rewards program! Bovada offers a lucrative rewards program that extends not just to the sportsbook but the racebook, poker room and casino as well. You’re enrolled automatically when you make your first deposit. For Bovada members that wager on NFL games, the program will give you reward points each time a wager you make is settled. Points are issued on the lesser of how much you wagered or won. 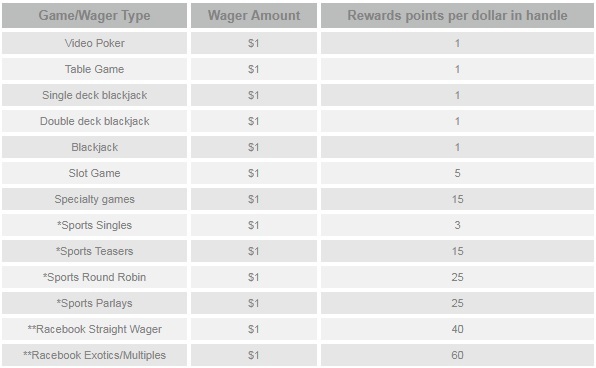 Additionally, points per dollar vary depending on the wager type. A single bet against the spread awards just one point per $1, but a parlay awards 25 points per $1. When ever you’ve accumulated enough rewards points, you can cash those points in for bonus dollars, which you can use for additional wagers. Let’s say that the New York Giants are -3 (-110) at home against the Dallas Cowboys. That means that Big Blue is favored by 3 points and Bovada expects the standard 10-percent vigorish. You place a $55 wager on the Giants who win the game 27-21, so they cover and you win the bet. You get your $55 back plus win $50, and since $50 is less than $55, you earn 50 rewards points. At the end of each day, Bovada determines if your account balance is less than $10 not including any money in play. If it is, then the sportsbook determines if you’ve suffered net losses from your last cashback bonus or your first deposit if you’ve never earned such a bonus. You then receive a bonus worth 2.5 percent of your net losses, and you only have to play through that bonus once! 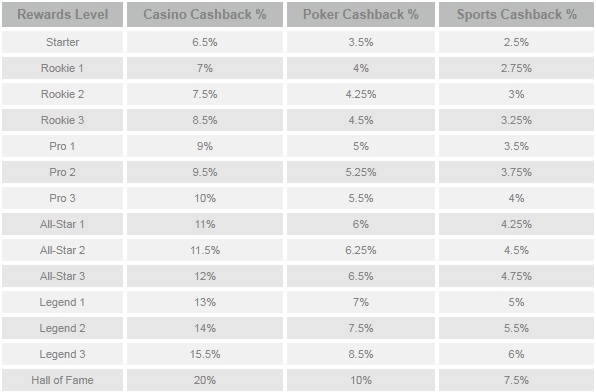 Note that you will receive a higher return on casino and poker losses, and your cashback percentage will increase across the board as you move up reward tiers. You begin at the Starter tier, but as you place more bets, you can move up through five additional tiers: Rookie, Pro, All-Star, Legend and Hall of Fame. The middle four tiers also have three sub-levels. A nice aspect of this program is that when you move up a tier or level, you can never lose that status as long as you remain active. Remaining active is as easy as logging in once every 18 months. Your tier is dictated by your tier points, which are earned alongside reward points. In the above example where you earned 50 reward points, you also earned 50 tier points. The advantages that come with moving up a tier include a more favorable cashback percentage and a greater return when cashing in reward points! Sign Up to Bovada Today!